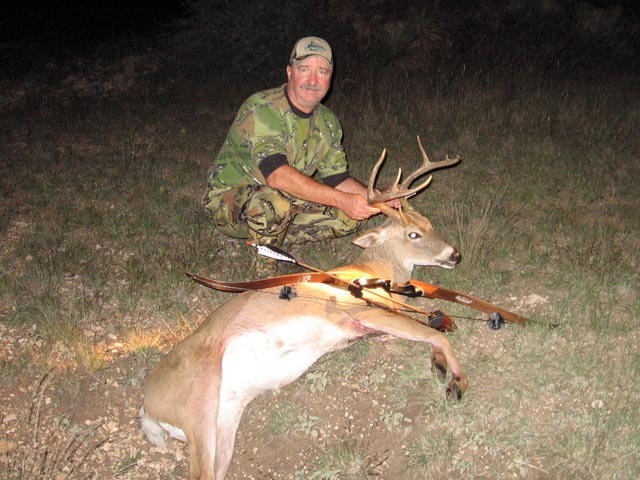 Thirty plus years ago I started bowhunting with a Bear recurve bow that had been given to me by a friend. 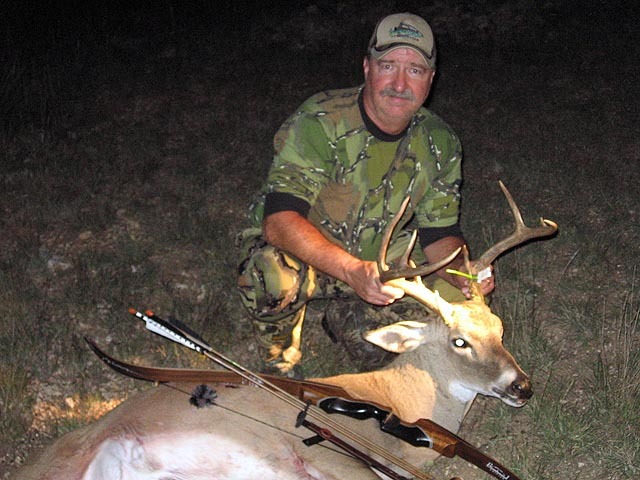 I was never successful with it and moved up to the modern Bear Whitetail compound bow and never looked back. Last year I took the biggest whitetail buck in my hunting career and decided it was time to step back in time and hunt with traditional equipment again. In February of this year I bought a recurve bow from one of our sponsors, Bob Lee Archery. The work began. I was frustrated, humbled, and elated learning to shoot without all of the conveniences of my modern Bow Tech compound but I worked thru it. 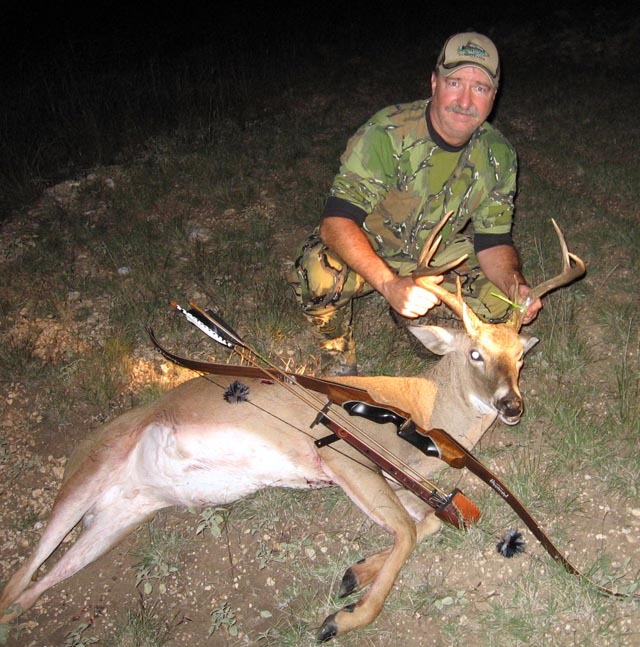 The best advise I got for hunting with this bow was when Rob Lee told me to leave my Bow Tech home when I went so I wouldn't be tempted to fall back to it when I got frustrated. I did. The season finally came. First I had to get used to the extra length of the bow. I was bumping everything around my stands with the limbs! I finally got that under control but my first three shots were clear misses; close but still misses!! I was frustrated and it was a good thing my Bow Tech was at home. On my third hunting trip I was sitting in my stand at sunset. I heard something scraping leaves on the backside of a brush thicket then the unmistakable sound of antlers raking a tree and a low grunt. I decided to try to call him in. I blew my grunt call a couple of times then waited. It was just a few seconds when I saw the buck sneak around the edge of the thicket. He was walking right into a shooting lane that I was anticipating but suddenly stopped. I had no shot. He backed up and turned around to leave. He would be passing thru another shooting lane but I would have to turn completely around in my stand and to complicate matters a small spike buck had walked in to see what was up. I managed to get turned around and in position just as the buck stepped into the shooting lane. I grunted real low to stop him, came to full draw and anchor and let the arrow fly. The buck was 6 yards away! There was no doubt the shot was good. I could see the entry and exit wounds as he ran away. I was shaking like a leaf in my stand. This was a moment 30 years in the making and I couldn't believe the feeling. After a 75 yard tracking job I finally had my first trad trophy. He is not Pope and Young but will always be one of my most cherished trophies. Trad hunting has brought the challenge of bowhunting that I love so much back to reality for me.